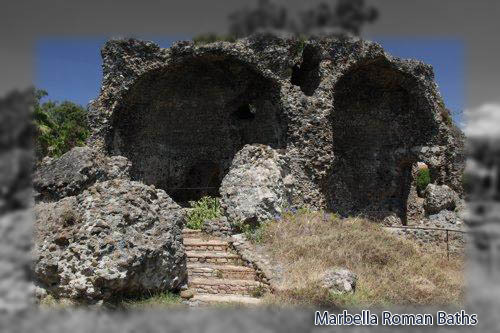 In San Pedro de Alcantara, very near the mouth of the river Guadalmina and the Paleo-Christian Basilica of Vega del Mar there are these roman architectonic remains that are thought they were used as baths. These remains caught the attention of who would pass through this place since the 16th century, where they named it the "baths of the old Moors", as the locals thought that they were remains of the old Arabs that had previously lived in these lands (the land were conquered from the Arabs in the year 1489). In a book written in 1782, known as the “diary of the journey through Andalusia and Portugal”, a writer describes the baths as a monument of great beauty, comparable to the Agripa Pantheon. This monument has received many comments over the centuries and many dreamed of its origin, until in 1931 they were declared National Monument and finally dated from the 3rd century before our era. The subsequent studies have shown us these baths that over the years have lost all its original beauty as before they were covered with mosaics that have disappeared today except for a few remains, but that still manage to transport us to the lower roman empire in our imagination while we explore its facilities. We’ll find different rooms communicated at different levels. In the exterior room is the vertical conduct in the way of a chimney. These baths may have been used by the ancient towns of Silniana and Salduba of which their exact locations are unknown till today. Near the remains of these baths there are old roman pools for the salting of the fish and the tower known as “Tower of the Vaults”, built in the 16th century as a maritime defence by the Christians. There are guided visits to the baths on Tuesdays, Thursdays and Saturdays at midday, but you must ask for an appointment first. You’ll need a car to get there, if you need one, you can check out our prices to hire a car in Malaga. On the map below you can see how to get from Malaga airport to San Pedro de Alcantara.